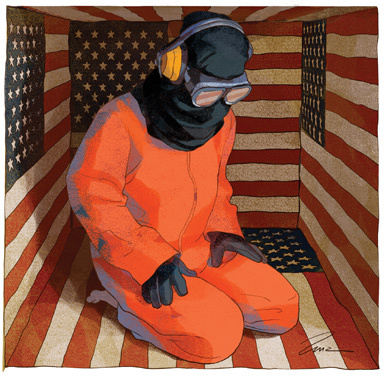 Terror suspects are held in US prisons on dubious evidence under inhumane conditions. Two days after being sworn in as the forty-fourth president of the United States, Barack Obama signed three executive orders, banning torture, requiring the CIA to use the same methods as the military in interrogating terror suspects, shutting down the network of secret CIA prisons and shuttering the prison at Guantánamo Bay, Cuba, within a year. "What the cynics fail to understand," the president proclaimed in his inaugural address, "is that the ground has shifted beneath them." But where exactly has the ground shifted? The places of focus–and much of the furor against Bush’s terror politics over the past few years–are outside our nation’s borders, in distant lands and faraway prisons. The problem of torture and other human rights violations in America’s "war on terror" has been framed as a problem that happens largely beyond our shores. The underlying assumption is that if Guantánamo detainees were to be tried on United States soil and in federal courts (as many groups demand), such egregious abuses would not occur. But Guantánamo is not simply an aberration; its closure will not return America to the rule of law or to its former standing among nations. Guantánamo is a particular way of seeing the Constitution, of constructing the landscape as a murky terrain of lurking enemies where the courts become part of the bulwark against such dangers, where rights have limits and where international standards must be weighed against national security. It is an outgrowth of a "war on terror" with historical precedents that took root under Clinton (in legislation like the 1996 Antiterrorism and Effective Death Penalty Act), spread like kudzu under Bush and infiltrated the fabric of the justice system. It is a pre-emptive strategy where stopping terrorism has come to mean detaining and prosecuting people who may not have committed any actual act of terrorism but whose religious beliefs and political associations ostensibly reveal an intention to do so. The Justice Department claims that the "centerpiece" of its case against Hashmi is the testimony of Junaid Babar. According to the government, in the beginning of 2004, Babar, also a United States citizen, stayed with Hashmi at his London apartment for two weeks. In his luggage, the government alleges, Babar had raincoats, ponchos and waterproof socks, which Babar later delivered to the third-ranking member of Al Qaeda in South Waziristan, Pakistan. It was alleged that Hashmi allowed Babar to call other conspirators in terror plots, using his cellphone. Babar, who was arrested in 2004 and has pleaded guilty to five counts of material support for Al Qaeda, faces up to seventy years in prison. While awaiting sentence, he has agreed to serve as a government witness in terror trials in Britain and Canada, as well as in Hashmi’s trial. For his cooperation, Babar will be rewarded with a reduced sentence. Material-support laws are predicated on guilt by association. They fashion a black box into which all sorts of constitutionally protected activities can be thrown and classified as suspect, if not criminal. Because there is little evidence in this case that links Hashmi directly to any criminal action, much of the government’s case will hinge on establishing his intent. To do this, the government will likely focus on statements Hashmi has made about US foreign policy, the treatment of Muslims here and abroad and other political issues. Hashmi, who was a member of the New York political group Al Muhajiroun as a student at Brooklyn College, advocated positions well outside the mainstream of American public opinion. Indeed, he drew the attention of Time and CNN in May 2002 as a student activist and potential homegrown threat; both quoted him at a 2002 Brooklyn College meeting, calling America "the biggest terrorist in the world." The government, however, has not designated Al Muhajiroun a terrorist organization or deemed membership in the organization illegal. This prosecution thus has the potential to criminalize constitutionally protected political speech. Hashmi has been in solitary confinement at MCC awaiting trial since May 2007. Since October of that year he has been held under Special Administrative Measures (SAMs) imposed and then renewed by the attorney general. The government’s authority to impose SAMs was established in 1996. Since 9/11, the standards for imposing them–and conditions for their renewal–have been significantly relaxed. Under the SAMs, Hashmi is allowed no contact with anyone–except his lawyer and, more recently, his parents–no calls, no letters, no talking to other prisoners through the walls, because his cell is electronically monitored inside and out. He must shower and go to the bathroom in view of the camera. He can write one letter a week to a single member of his family, but he cannot use more than three pieces of paper. He is forbidden any contact–directly or through his attorneys–with the news media. He can read newspapers but only portions approved by his jailers–and not until thirty days after publication. He is allowed only one hour out of his cell a day–which is periodically withheld–and is not allowed fresh air but is forced to exercise in a solitary cage. The SAMs pose a significant threat to Hashmi’s mental health and his ability to participate fully in his defense. Their severity casts a pall of suspicion over him, in effect depicting him as guilty before he even enters the courtroom. His "proclivity for violence" is cited as the reason for these measures–despite the fact that he has never been charged with (let alone convicted of) committing an act of violence. At Hashmi’s January 23 hearing, Federal District Judge Loretta Preska heard the defense’s motion challenging the conditions of his pretrial confinement. The defense presented evidence on the devastating impact long-term solitary confinement and sensory deprivation have on prisoners’ mental as well as physical health and on their ability to participate in their defense. Defense lawyer Sean Maher cited the work of various medical experts and scholars like University of California, Santa Cruz, psychology professor Craig Haney, who concludes that "there is not a single published study of solitary or supermax-like confinement…that failed to result in negative psychological effects." The defense asked for a modest set of changes in the conditions of Hashmi’s confinement–that his elderly and disabled parents be allowed to visit him together, that he be allowed to exercise in MCC’s recreational facility on the roof and with other prisoners, to participate in group prayer and to have a cellmate. The judge refused all these requests, siding with the US Attorney’s tautological argument that the original imposition of SAMs dictating higher security measures proved the paramount national security considerations of Hashimi’s case, thus rendering the conditions of his confinement legitimate and necessary. It is not surprising, then, that in cases like Hashmi’s where SAMs have been imposed since 9/11, almost none have been lifted. Judge Preska also claimed that Hashmi’s restrictions are "administrative rather than punitive" and thus constitutional. The inhumane conditions of Hashmi’s pretrial confinement are not aberrational. Canadian citizen and US legal resident Mohammed Warsame has been held for more than five years in Minneapolis without trial (most of it in solitary confinement under SAMs) despite a speedy-trial motion his lawyers filed more than three years ago. In December 2003 Warsame was secreted away for four days of "voluntary" questioning at a military base in northern Minnesota. Authorities believed he had information on Zacarias Moussaoui, since the two men had attended the same mosque in Minnesota. Held as a material witness, Warsame hardly knew Moussaoui and had no testimony to provide about him, even when brought to his trial. The government then filed material-support charges against Warsame, claiming he had taught English to Taliban nurses, had eaten in the same room with Osama bin Laden and sent $2,000 to people in Afghanistan the government claims were with the Taliban. Civil rights violations are also becoming entrenched in prison policy. In December 2006 the Justice Department quietly set up a segregated facility, the Communication Management Unit, at the federal prison in Terre Haute, Indiana, for medium-security terrorism inmates. Nearly all the inmates transferred to Terre Haute are Muslims. All calls and mail (communication customarily off limits to prison officials) are monitored, and prisoners are required to communicate with each other only in English. The highest-level terrorists are typically sent to the Penitentiary-Administrative Maximum Facility, known as Supermax, in Florence, Colorado. Colorado Governor Bill Ritter is considering opening the prison’s doors to the Guantánamo detainees; the facility, according to Ritter’s spokesman, is "built for just that type of high-risk inmate." Amnesty International has been critical of conditions at Supermax, where prisoners have almost no opportunity for human interaction, physical exercise or mental stimulation–conditions many of the men faced at Guantánamo and that Hashmi faces in Manhattan. Indeed, one of the United States’ most wanted terror suspects, Khalid al-Fawwaz, is fighting extradition to the United States on the grounds that the conditions in a prison like Supermax in Colorado breach Article Three of Britain’s Human Rights Act, which prohibits torture and other inhuman or degrading treatment or punishment. In Miami, prosecutors are going back to court for the third time, seeking conviction on material-support charges of six men for a plot to blow up the Sears Tower. The nightly news in June 2006 trumpeted the arrest of seven "Muslim" men and the dashing of their plan to attack the Sears Tower as part of a jihad. (By the next day, however, even the FBI described the plan as "aspirational rather than operational.") The seven men are actually members of the Moorish Science Temple, a religious sect that blends elements of Christianity, Judaism, Islam and black nationalism. The case, lacking any concrete evidence of weapons or blueprints and using questionable informants (the jurors felt that an FBI informant led the men on), has already resulted in two mistrials. Yet the US Attorney has pressed for the third trial in order to "safeguard the community," even though no new evidence has come to light. Media outlets across the country hyped "sleeper cells" discovered in Detroit in 2002 and Lodi, California, in 2005. Two men in Detroit were convicted in 2003 but had their sentences subsequently suspended (and the US Attorney was indicted) when it was revealed that the US Attorney concealed exculpatory evidence. In Lodi another FBI informant, who was paid $250,000 for his work, appears to have acted as an agent provocateur with father and son Umer and Hamid Hayat. The government succeeded in getting a conviction of the son using the contradictory and misleading confessions of the Hayats–both of whom sought to cooperate with investigators. (The father went so far as to claim that his son trained in a basement, including doing pole-vaulting exercises. When the FBI interviewer commented that the basement ceiling must have been very high, the father concurred.) A longtime FBI agent was going to testify for the Hayats’ defense that this was "the most derelict and juvenile investigation" he had ever seen the FBI put forth, but the court disallowed the testimony. Then there is the case of "terrorist leader" and University of South Florida professor Sami Al-Arian, detailed by Alexander Cockburn in The Nation ["The Persecution of Sami Al-Arian," March 19, 2007; "The Ongoing Persecution of Sami Al-Arian," July 21, 2008]. After more than a decade of surveillance, years of solitary confinement and a six-month trial that cost $50 million, the jury acquitted Al-Arian on the eight most serious charges (and deadlocked on the rest). The government pushed Al-Arian into taking a plea on one count and then reneged on its agreement by subpoenaing him before a grand jury. Refusing to appear, Al-Arian now faces contempt-of-court charges brought by the Assistant US Attorney for the Eastern District of Virginia. Judge Leonie Brinkema is considering dismissing the case. In early March, she questioned the US Attorney’s actions in Al-Arian’s plea agreement: "I think there’s something more important here, and that’s the integrity of the Justice Department." In his confirmation hearing, Attorney General-nominee Eric Holder unequivocally declared that "Guantánamo will be closed," yet simultaneously pledged to "fight terrorism with every available tool." It is important to close a renegade prison in a remote corner of Cuba. But it is just as important, if much harder, to look at ourselves at home. It is here, in Lower Manhattan, Minneapolis and Miami, in our Justice Department, where we must shift the ground. It is here where US citizens and residents–in our federal court system and under our watch–await trial, often facing secret and specious evidence under inhumane conditions that rise to the level of cruel and unusual punishment. The task of ending Guantánamo requires that we examine and rebuild the political and judicial systems within our borders–to reform the Justice Department, the courts and prison policy. We would be wise to heed former Chief Justice Earl Warren’s warning about the dangers lurking in our judicial processes: "It would indeed be ironic," Warren cautioned in 1967, "if, in the name of national defense, we would sanction the subversion of…those liberties…which [make] the defense of the nation worthwhile."